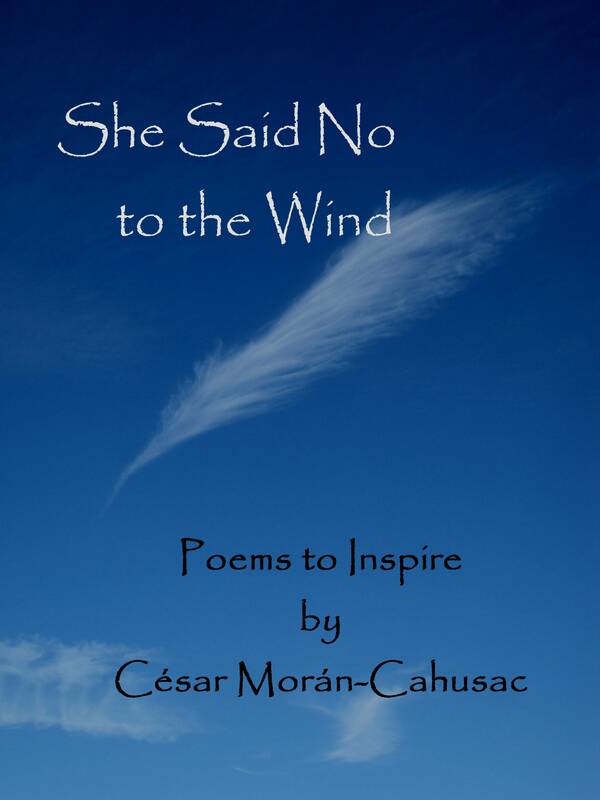 I was introduced to César Moran-Cahusac through our Christina Hamlett, who designed the cover for his new poetry collection, She Said No to the Wind. As a fellow poet and nature lover, I was enthusiastic to connect with him. Q: In your work as an activist, poet, peace advocate and environmentalist, you share a lot of yourself with others. What are some things that people don’t know about you? A: I think what I don’t share are my weaknesses and fears; it has been a long process to even start recognizing them. Mostly because one was taught not to be weak and vulnerable. But, that is not true. On the contrary it is vulnerability that makes you resilient. So, as I have been writing I have been learning to accept my vulnerabilities and fears, understand and then overcome them. It has been my poetry that has allowed me to expose them to myself; this allowed me to be courageous enough to compile them metaphorically in my first poetry anthology called She Said No to the Wind. So, it has been a long walk where I was accompanied by my fears, and as we took this stroll we talked a lot and now I feel comfortable with some of them. There is still a lot of talking to do. Q: That’s awesome—your poetry has a lot of heart and sharing that allows us to open up, too. What first drove you to write? A: I have always been a sensitive and very passionate individual. By this I want to say that I feel things very intensively and these feelings are just there, lingering around me. In fact, before waking up in the morning I would find myself with phrases and even complete poems in my head, but at that time I did not pay attention to them. I did not consider them important or even good enough to be saved by writing them on a piece of paper. Then little by little I took the risk to jot them down and play with the words I had written. That is when the magic and the infatuation with words started, their meaning and sound became intensively beautiful to me. So, poetry in the form of free prose allowed me to get these feelings out, as I wanted to shout, cry, laugh, hug, run, dance, jump, and feel. Poetry became the medium to let it all out. Q: Thank you for taking that risk of publishing it, letting it all out with us. Your cover captures the spirit of the book, with its message “to inspire”. In what other ways do you hope to connect with your readers? A: I want them to genuinely feel alive, this is to fuel in them the urge to look around and embrace the beauty that surrounds them and that every one of them has stories that can be portrayed in a wonderful way. Hopefully, as they read this book and its lines they can understand who I am, how I see the world and kindle in the reader the urge to live life as uniquely as possible. Q: What a beautiful way to see things. The poems in your book celebrate daily events. What do you consider the value and power of the seemingly mundane? A: The mundane is what builds history; it has all the events that construct our lives and the lives of the people who surround us. We all, within our natural setting, weave a fantastic living textile that drapes over the landscape. It is then when the mundane expresses colors, textures, aromas, that precipitates the wild array of events that construct our lives and makes us move us forward. By being sensitive to this magic one becomes uniquely compassionate. Q: Your poetry also celebrates the magic of nature. From your work in the field and your Masters in Environmental Management, you’ve considered our world from multiple perspectives. What are you most passionate about when it comes to nature and conservation? A: Yes, nature is the mother—it is what feeds us, embraces, and cradles our interwoven diverse civilization. Without her we are absolutely nothing. So by understanding her processes and fully acknowledging the fact that the consumption of natural resources is a blessing; we can see the necessity to tread gently over her, and by this I mean tiptoe. So interacting with her should not be this greedy destruction. Moreover, we have to boldly declare the paradigm of endless growth as obsolete, not even think of sustainable development. Q: What do you mean, abandon sustainable development? A: I do not believe in sustainable development, in the sense that nothing can grow forever; the concept that makes more sense is resilience. Sustainable development is trying to meet the needs of the present without compromising the ability of future generations to meet their own needs. But, nothing that grows forever is sustainable… it was a great concept presented in the Brundtland report in 1987. That had the idea to inspire people to care for nature. But this has become a catchphrase, and abused by the interests of advocates of exponential economic growth, undermining environmental reforms. We are defunct as a species if we do not consider the fact that we need to start de-growing to reach an adequate balance and actively reduce our demands on nature. Q: How it is possible to “de-grow”? A: De-growth is a new term that expresses “that the only way for humanity to live within its biophysical limits and mitigate the effects of climate change is to reduce economic activity, to downscale consumerist lifestyles, to move beyond conventional energy sources, to give up on the fantasy of ‘decoupling’ economic and population growth from environmental impacts, and to rethink the technologies that have gotten us into our current predicament. There has been no known society that has simultaneously expanded economic activity and reduced absolute energy consumption” taken from A Call to Look Past An Ecomodernist Manifesto: A Degrowth Critique [http://www.resilience.org/articles/General/2015/05_May/A-Degrowth-Response-to-An-Ecomodernist-Manifesto.pdf]. This should liberate us from thinking naïvely that technology will save us from overriding planet Earth and look into how can we become resilient and design actions towards adaptation. Q: You are an advocate of environmentalism and peace. How do you consider these to be connected? A: I think they are connected through compassion—when we have sincere, compassionate feelings for ourselves, these feelings ripple into the environment. In this way, we build care and slowly but surely the way we look at nature changes, perceiving its small marvels as a delicate equilibrium that can’t be disrupted violently. This is when peace sets in as the way to be in harmony with nature and the rest of living and human beings. Q: What inspires you in your daily life? A: Well, to be able to take the any opportunity to smile and enjoy life thoroughly by just recognizing its daily events. Just the fact of waking up in the morning makes me smile, inspiration comes by being open-minded, allowing everything to inspire me. Sounds, words people say, the weather, whatever comes my way has a meaning and brings sensations that need to be expressed. Q: You also express yourself with martial arts. What draws you to practice? A: I have practiced two martial arts, Kung Fu and Aikido. The latter is called the art of peace or the way of harmony. I try to live in harmony and I recognize that this is very difficult, but as I train all I want is to polish the art, the expression, the connection, the form, the movement, the ability to create kuzushi or to take your opponents’ balance in a subtle way. So, what draws me to practice is the endless opportunity one has to polish and perfect a technique Like with words, I go about with my training—I try to use them in the most precise way possible. The arts in general offer you a stream of incredible surprises than can only be found if you practice them committedly. One always has to train with a beginner’s mind, willing to learn something new every day. Q: In all your activities, as an activist, advocate, poet, and as one who practices peace, is there something that you consider joins them together? A: I think it’s my heart that joins them, yes, my heart is a wonderful thing because it embraces them all, I learn from every single one of them. They all interact, taking energy and knowledge from each other, and my heart fuels them, making them move forward with passion. Q: There’s a saying that it takes a village to raise a child, but it also takes a community to raise an author, an idea. Your book is dedicated to several key people (and our ultimate shared mother, nature). In what way have the people in your life been your village? A: When we interact with people, they leave in us experiences from which we learn. This is in some ways streams of good and the bad, the happy and the sad. On which we can navigate, I tend to navigate on the positive side of things, when I meet or interact with the negative side I learn from them that I definitely do not want to be there or become that. “Positiveness” is the force that I share and take from people. This I have I learned from my mother and father that taught me to always look forward for a new day, for a new way and to be able to appreciate the opportunity to learn something new. And in that sense I give thanks to all the above, to be kind and compassionate to everybody and to draw a smile as fast as one can. In fact become the fastest smile out there and with this practice always laugh every single day of my life. So, it’s my responsibility to stir happiness and postiveness in my village. The people I have mentioned in my dedication have sparked in me this way of being, I have become resilient in so many ways thanks to them and furthermore I would have to add more people on to that list. So I can take the opportunity now to thank them all for inspiring and allowing me to be who I am. Q: When you look at our future, as a humanitarian and nature advocate, what do you see? A: I see that there is an urge to change people’s attitudes and level of consciousness. It is unbearable to see how opportunism, manipulation, greediness, oblique disdain for equal human rights is still rampant. If words can trickle down as gentle rain and sensitize people; well let’s write, share the words in all its forms, so that being said I will continue writing and expressing what I see and feel intensively. Editorial Note: Over the course of the interview, César revealed he had been inspired to pen a new poem. We are happy and honored to share it here with our readers. Can You Draw Your Smile? Can you draw it fast, as fast as you can? Yes, can you make that sparkling ivory shine like a blaze? Yes, a squawking commotion like macaws’ flying into the sunset. Fill that face with content; yes be quick, as fast as you can. This entry was posted in activism, Cesar Moran-Cahusac, environment, inspirational, nature, Peru, poetry and tagged activism, Cesar Moran-Cahusac, environment, inspirational, nature, Peru, poetry.